My first time riding a horse! 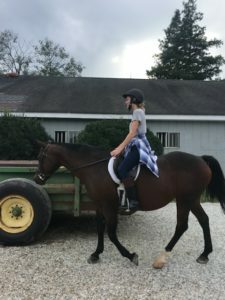 This weekend I went to Richmond, VA and visited my friend Anna who is a talented rider. I’ve been afraid of horses my entire life (they are HUGE! ), but she taught me how gentle and obedient they are, and by the end of the day I was comfortably riding and feeding them. Fear can keep you from doing great things – try conquering yours this week! You might be wonderfully surprised.